Kayak Africa had a stand at this year’s Getaway Show in Cape Town for the first time in quite a number of years. 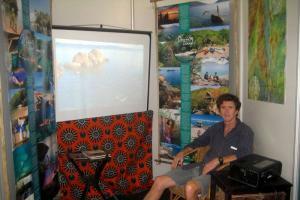 Director, Clive Bester and long-time reservations person, Bee Roux, manned the stand for the three days of the show, talking to thousands of people and did a great job of exposing both Malawi and the islands to visitors. Around 15 000 people visit the show every year. Next up, Clive will be at the Malawi stand at Indaba, held at the Albert Luthuli Convention Centre in Durban from 12 – 15 May this year. If you are attending, hope you find time to visit us!